One holistic treatment for swollen or bruised eyes due to minor eye trauma was described in the Avian Health forum. Darlene puts 1 to 2 drops 99.9% plain pure aloe vera juice at room temperature on the eye 6 to 8 times a day. She reports that within 2 or 3 days the eye is back to normal. She recommends this procedure one day more once the eye is back to normal. Even though this should be administered at room temperature, it is important to store the aloe vera juice in the refrigerator in between treatments. Take out a portion a while before administering it to allow it to warm up to room temperature. Please note this is only for bruised or swollen eyes due to injury. More serious injuries should be treated by an avian vet. Aloe Vera's healing and soothing properties are well documented. This plant is easy to grow in your own yard - or maybe even inside, if you live in a climate that doesn't provide the right conditions for this plant. It is very easy to cut off a section of this plant and the Aloe Vera juice comes pouring out quite readily. We use it after insect bites or other skin injuries. Please refer to this (external) weblink for information on Aloe (Green and Healthy website). Also, below is an excellent video that outlines things that might help. Toxoplasmosis (parasitic infection) can result in blindness, head tilt, circling and paralysis. Advanced ear infection (bacterial): Inspection of the ear opening should show swollen tissues (potentially closing up the entire opening) and some discharge is likely. Temporarily distorted pupils can be caused by focal spasm of the iris dilator muscles, which generally resolve themselves within a few minutes. The cause is generally of benign neural origin and requires no treatment. Still, if other symptoms appear, a vet may need to be consulted. Longer-lasting changes to the shape of a pupil could be a result of an eye infection (following a scratch to the cornea), resulting in an inflammation of the iris. This can result in blindness if not treated. An inflammation of the iris (which could be caused by an infection, autoimmune disorder, arthritis or skin disease) could also be possibilities. 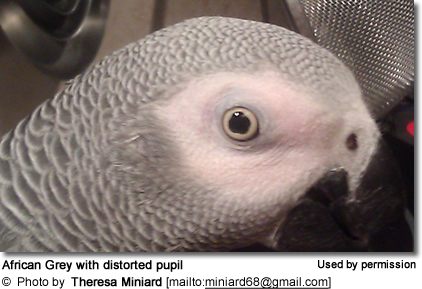 Conjunctivitis is not a typical symptom of Parrot Fever, but it is a symptom that occasionally occurs in birds suffering from Parrot Fever. Primary symptoms would be an upper respiratory infection with nasal and/ or ocular (eye) discharge, diarrhea with the possibility of conjunctivitis and other symptoms. 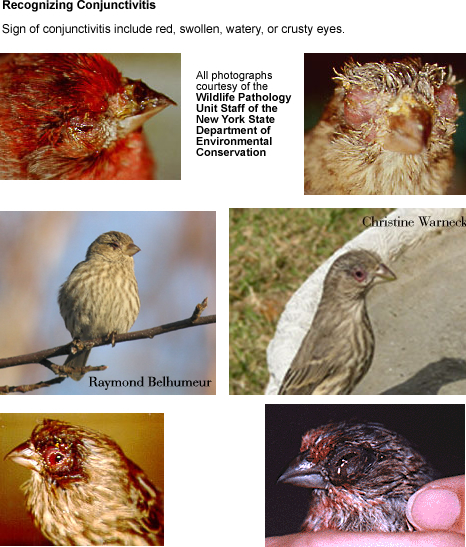 A disease affecting chicken, pheasants, guinea fowl, turkeys and other game birds. Common symptoms: Respiratory distress accompanied by watery and swollen eyes. Affects fowls, pheasants and turkeys. Water fowl, such as ducks and geese, show no signs, but ducks are known to carry ILT. Wild birds may act as carriers. Early symptoms may include bouts of hard swallowing, ruffled feathers on the back of the head, squinting and watering of one or both eyes, known as conjunctivitis. 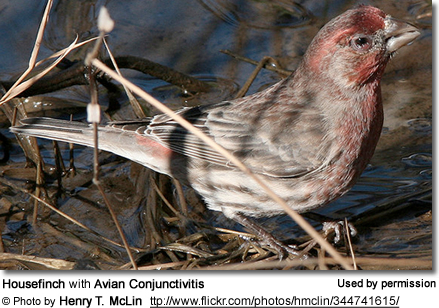 Sick birds may appear thin, fluffed up, and may have swollen eyelids. They are often lethargic and easy to handle. Exposure / inhalation of cigarette, cigar and pipe smoke by birds can cause chronic eye problems, skin irritation and respiratory disease.